Citation Information: J Clin Invest. 2006;116(1):22-26. https://doi.org/10.1172/JCI27476. 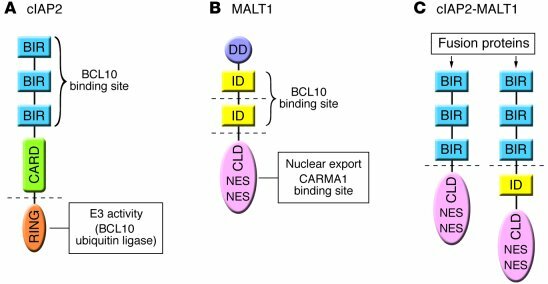 cIAP2, MALT1, and cIAP2-MALT1 organization. Schematic diagram showing the structure of cIAP2 (A), MALT1 (B), and the 2 most commonly observed cIAP2-MALT1 fusion proteins (C), including their known functional domains. The dashed lines show the most frequent breakpoint sites occurring in the t(11;18)(q21;q21) chromosomal translocation. The study by Hu et al. (22) in this issue of the JCI adds to our understanding of the properties of cIAP2, showing BCL10 ubiquitin ligase activity in its COOH-terminal region together with a BCL10 binding site within its NH2-terminal region. RING, really interesting new gene; ID, Ig-like domain; CLD, caspase-like domain.